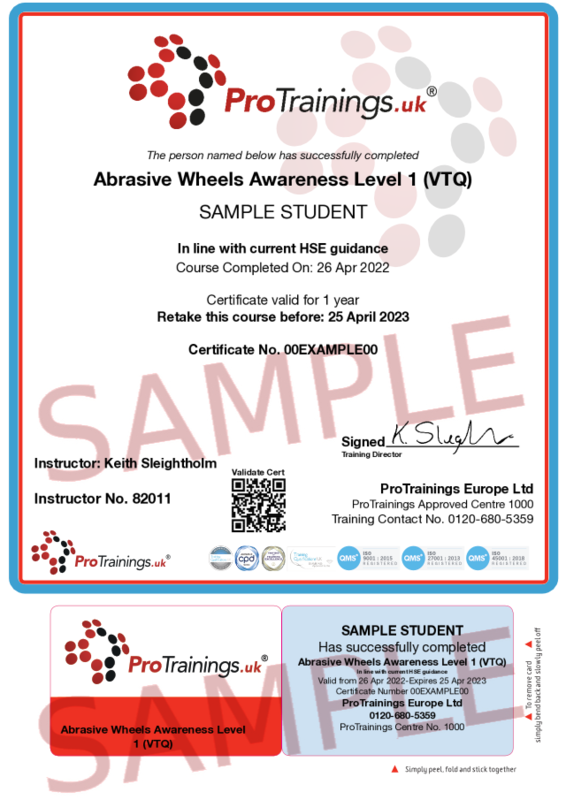 Abrasive wheel training is aimed at anyone who uses or works near someone using abrasive wheels to understand the responsibilities in the workplace. This is a classroom course and can be taught at one of our instructor's centres or we can arrange onsite courses at your workplace. to comply with the Provision and use of Work Equipment 1998 (PUWER) that all staff who use abrasive wheels receive abrasive wheels training in the safe use of the tools and changing of wheels. The course also helps managers understand their duties under the regulations. The General Product Safety Regulations (2005) and new codes of practice have extended the requirements for training to cover abrasive wheel equipment used in the consumer market and include those manufacturing, specifying, selling, purchasing, supervising and using abrasive wheel equipment.